It’s that time of the year as we prepare our home for the holidays. Those personal touches of handmade items mean so much and bring back nostalgic memories of past Christmas holidays. Start your own tradition of passing down this special tree skirt by making your very own today! This lovely Fabulous Flurries Tree Skirt is the perfect project to accent your home and tree for generations to come! The snowflake appliqués are a nice touch of winter. You can create your own by adding other appliqués or just leave the skirt free and clear of any embellishments for a more simple touch. Change colors and make it festive as you wish for your home. Enjoy this lovely piece that is sure to be a hit for years! My dad will continue to be the videographer, editor, and photographer for our videos when I move away. 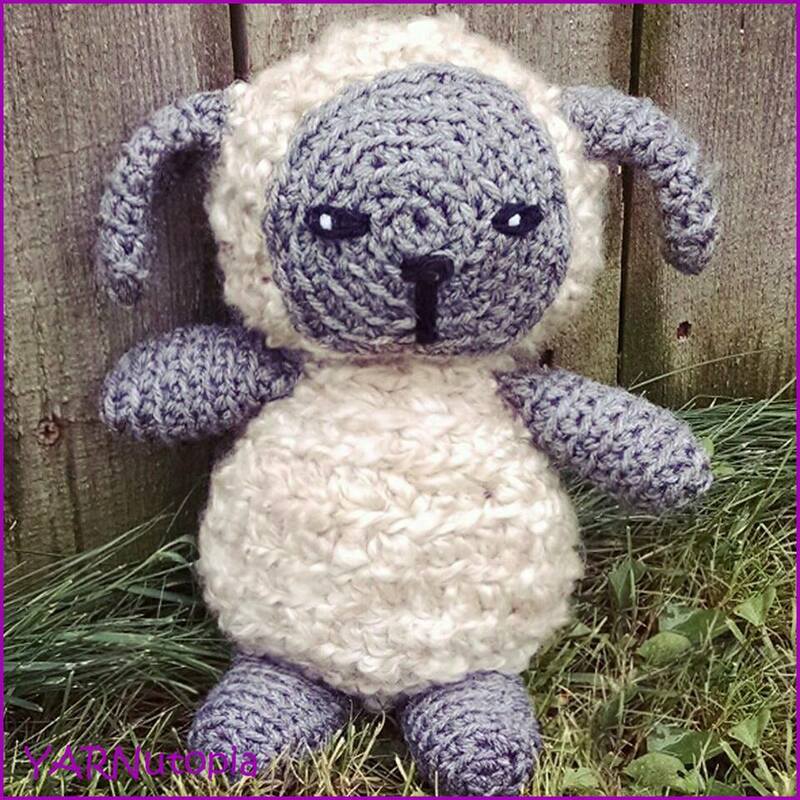 Support YARNutopia today so we can continue to bring you clear, quality crochet tutorials even after I move into my new home! There will be an added expense of more travel and hopefully this won’t deter our ability to provide consistent videos on a weekly basis. **You can always contact me via Facebook if you have any problems with the pattern. I am happy to help if you have any questions along the way. ***You can sell anything you make from my patterns, please just link back to my website YARNutopia.com. Thank you! Share your work on Facebook! Visit My Ravelry Store and add this to your Favorites! Enjoy this video and subscribe to my channel on YouTube for more tutorials on how to crochet! Leave a comment, and share with your friends! You *may* sell items made from my pattern, but please reference my website YARNutopia.com. Please do not copy, sell, and/or post this pattern and claim it as your own. -You can use a smaller or larger hook to make this square depending on your tension. I wouldn’t use anything larger than a K-6.50mm Crochet Hook though. If you have any confusion or difficulty with reading this pattern, please watch the video tutorial to have visual instructions. Row 7: Ch 4, Sk ch sp, * DC in each st until ch 1 sp, ch 1, sk ch 1 sp, repeat from * across. Row 21: ch 1, RSC across in each st and each ch 1 sp across. Fasten off. Ch 4, Sl st in 1st ch to form a ring. Rnd 2: Sl st in ch 6 sp, *Ch 6, sl st in 4th ch from hook, ch 5, sl st in same ch, ch 3, sl st in same ch, ch 2, sl st in next ch 6 sp, repeat from * around. Fasten off with long tail for sewing, weave in ends. Ch 4, sl st to 1st ch to form a ring. Rnd 3: In any ch 6 sp: Ch up 1 [SC, HDC, 2DC, Ch 3, 2DC, HDC, SC] in same sp, Sl St in next SC and in next CH sp, repeat from * around. Sl st to 1st SC of this round. Fasten off with long tail for sewing. I created this Berry Giving Granny Square design to add to our 365 Days of Granny Squares project. It uses variety of crochet stitches to create an interesting design! I hope you enjoy making your square! A couple disclaimers before you start: Be sure to check your tension and use the correct size hook for your square. I demonstrate with an H-5.00mm crochet hook in the video tutorial, but you can make yours bigger or smaller by using a bigger or smaller hook. Also, if yours turns out wonky when you are finished, you may need to block this square to make it nice and flat. -You can use a smaller or larger hook to make this square depending on your tension. I wouldn’t use anything larger than an I-5.5mm Crochet Hook though. Beg. Cluster: [YO, Insert hook, YO, pull through] 3 times, YO, pull through all 4 loops. Cluster: [YO, insert hook, YO, pull through] 4 times, YO, pull through all 5 loops. 2DCcluster: [YO, Insert Hook, YO, Pull through] 2 times, YO, pull through 3 loops. Rnd 3: In a gap between the groupings (See video tutorial for specific location), Ch up 2, DC in same sp (counts as beg. 2DCcluster, Ch 3, 2DCcluster in Previous DC just made, 2DCcluster in same gap between HDC’s, * Ch 4, 2DCcluster in next gap, Ch 3, 2DCcluster in previous cluster just made, 2DCcluster in same gap, repeat from * around, sl st to beg. Rnd 4: In a ch 4 sp, ch 1, SC in same sp, *DC into each HDC from round 2 working around the ch 4 sp hiding it in the sts, SC in same ch 4 sp, Ch 2, sc in next ch 4 sp, repeat from * around putting clusters in front of ch 2 sps. Sl st to 1st sc. Rnd 5: In any ch 2 sp behind a cluster: Ch 3 (counts as DC), 3 DC in same sp, *BPDC in each of the next 6 sts, 4 DC in next ch 2 sp, repeat from * around. Sl st to beg. ch 3. Rnd 6: Ch 4 (counts as TR), TR in next, *DC in next 2 sts, HDC in next 2 sts, SC in next 3 sts, HDC in next 2 sts, DC in next 2 sts, TR in next 2 sts, Ch 3, TR in next 2 sts, repeat from * around, sl st to beg ch 4. Rnd 7: ch up 1, SC in all sts around, [2sc, ch 2, 2 sc] in each corner. This post contains affiliate links, which means if you click on the link and buy from the linked websites, I will receive a small percentage of the value of your order. The amount you pay is not changed. I created this Frosty Flakes Granny Square design to add to our 365 Days of Granny Squares project. It uses variety of crochet stitches to create an interesting design! I hope you enjoy making your square! Rnd 5: With blue, In any 3rd ch of ch 5 sp: * Ch 10, Sl st in 3rd ch of next ch 5 sp, repeat from * around, sl st to 1st ch of beg. ch 10. Rnd 7: Ch up 1, SC in 1st 5 sts, (working behind your work) TR in the Ch 3 sp of round 4, SC in next 4 sts, [sc, ch 2, sc] in corner, sc in next 9 sts, (working behind your work) TR in the Ch 3 sp of round 4, SC in next 9 sts, [sc, ch 2, sc] in corner, SC in next 4 sts, (working behind your work) TR in the Ch 3 sp of round 4, SC in next 10 sts, TR in ch 3 sp of round 4, SC in next 4 sts, [sc, ch 2, sc] in corner, SC in next 9 sts, TR in Ch 3 sp of round 4, SC in next 9 sts, [SC, ch 2, SC] in corner, SC in next 4 sts, TR in ch 3 Sp of round 4, SC in last 5 sts. Sl st to 1st sc. Rnd 8: Ch up 2, (counts as HDC) (See video tutorial for visual instructions), HDC in each st, FPDC around each TR working in Ch 10 sp from round 5, and work [SC, ch 2, SC] in corners. Sl st to ch 2 at the beginning. Like this granny square?? Try the Fabulous Flurries Tree Skirt! Holiday entertaining is right around the corner. I personally enjoy tea with friends. Add a special touch to your table setting with The Joyful Teapot Cozy! I added the word “Joy” to my teapot, but you can add any word. It’s very simple to chain and sew it onto the cozy. You don’t have to use holly leaves and berries as your embellishments either. Have fun with it and get creative by adding flowers, leaves, or other appliqués to make your teapot cozy personal. The Joyful Teapot Cozy makes a lovely gift idea. Wrapped around a vintage teapot and filled with specialty teas, this would go far in making someone’s holiday tea-rrific! Now it’s time to pour yourself a cup of hot tea, pull out your hook and get started today! Information at the beginning of the video, Tutorial actually starts at 9 minutes. ***You can always contact me if you have any problems with the pattern. I am happy to help if you have any questions along the way. You may sell items made from my pattern, but please reference my name and Etsy Shop (YARNutopia). Please do not copy and post this pattern and claim it as your own. -This pattern is for a standard 4-cup round, side handle teapot with a lid and a curved spout. You could make it smaller or bigger just making more rows on the sides. -You do not have to add the appliques, you could just have a plain teapot cozy sans the leaf/word design. -This teapot Cozy is worked from the top down. Puff: [YO, Insert Hook, YO, Pull Through] 2 times. YO, pull through all 5 loops on hook. Puff made. Ch 12, sl st to 1st ch to form a large ring. Row 18: HDC in each st across. Fasten off with Long tail for this side. When you make the other side, you can cut your yarn short. (See video tutorial for visual instructions. Attach your yarn to the unworked st from Round 7. Crochet a button hole loop after your last row by chaining 6, and sl st back into st. Fasten off. Sew button to bottom back of cozy on the opposite side of button hole loop. Working on opposite side of foundation chain: SC in next, HDC in next 4, SC in next, Sl st in last. Do not attach. Round 2: [Sl st in next 2 sts, Picot] 3 times, sl st in ch 2 sp, ch 2, Sl st in same ch 2 sp, [Sl st in next 2 sts, Picot] 3 times. Sl st to beginning. Fasten off with long tail for sewing. I recommend watching the video tutorial to learn how to sew all the pieces to your teapot cozy. Sew leaves and berries to teapot cozy. For the word “JOY” just chain an amount and pin it to the cozy and sew it on. You can also embroider the word to the cozy if you wish. Have fun with it! See video tutorial for visual instructions on all the pieces and where they go. Here is the Fallen Leaves Cup Cozy! One leaf applique doubles as a secret pocket which is perfect for a tea bag, some cash, or a gift card to a coffee shop. Mug cozies make great gifts for family, friends, neighbors, teachers, colleagues and many others on your gift giving list. Some suggested gift ideas: Mug or Travel mug + Cup Cozy + Hot Cocoa/Cash/Tea Bags/Specialty Coffee makes the perfect gift for that “hard to buy for” person on your list! The handmade cup cozy adds a personal touch to an already awesome idea! I have added a button to my cup cozy. You can get wooden buttons at the Etsy Shop Wood Be Fancy. You do not have to use a button, you could sew the seam up and have it slide on a travel mug. Follow along with this video tutorial to learn how to make this cup cozy: The instructions start at 6 Minutes, 50 Seconds. -This pattern is for a standard sized cup. You could make it smaller or bigger just making more rows on your backing portion. -You do not have to add the appliques, you could just have a plain cup cozy sans the leaf design. -You can make the backing of your cup cozy bigger by chaining any even number. Ch 12 or any even number. Rows 4-28: Repeat rows 2 and 3 ending on a repeat of Row 2. Fasten off with long tail if you are sewing it closed. Fasten off with short tail if you are not sewing it closed. Weave in all ends if you are adding a button. Working on opposite side of foundation chain: TR in next, DC in next, HDC in next 2, SC in next 2, Sl st in last. Round 2: [Sl st in next 2 sts, Picot] 5 times, sl st in next 3 sts, ch 5, sl st in 2nd ch from hook and next 3 chs, sl st back in the same st on round 1 of the leaf, sl st in next 3 sts, Picot, [sl st in next 2 sts, Picot] 5 times, sl st to beginning, Picot, Fasten off. Sew leaves and button to cup cozy. When sewing one leaf, be sure to keep it open as a pocket. Chain a loop on the edge of the cup cozy for looping around the button. The unicorn gives us the power to believe that anything is possible. These fun and mythical creatures are what fantasies and dreams are made of. This pattern will transform a basic pair of slippers into unicorns that is fun for all ages! Not looking to make unicorn slippers? Transform yours into other creatures with a few modifications! My video tutorial and FREE written pattern gives instructions on how to make 3 different sizes. I think we all could use some cozy unicorn slippers. Am I right? -The video tutorial ONLY shows the MEDIUM size. -The sole is made and then the back of the slipper is made and then the front of the slipper and embellishments are made. If you are making smaller or bigger sizes, follow the written pattern for the sole and then watch the video tutorial for help on making the back of the slipper and the front of the slipper. -The front of the slipper is the same on ALL sizes. The back may be a little different because of the stitch counts. -This pattern is written for one foot. Be sure to make enough pieces for two feet. -Depending on how stuffed you want this slipper, you can stuff it as much as you need. The more you stuff, the more your foot will be pushed down into the sole. Round 4: Ch 1, SC in 1st st, 2 SC in next, HDC in next 20 Sts, DC in next 3 sts, 2 DC in each of the next 6 sts, DC in next 3 sts, HDC in next 20 sts, 2 SC in next st, 1 SC in last sts. Sl st to first st. Round 6: Ch 1, turn, (Looking at wrong side of work), Sl st in each st around (73 sts), turn. Round 7: Ch 1, (Looking at right side of work) SC around, Sl st to beginning. Round 8: Ch 1, SC around, sl st to beginning. Fasten off. Go on to making the Back of slipper. Round 4: Ch 1, SC in 1st st, 2 SC in next, HDC in next 20 Sts, DC in next 3 sts, 2 DC in each of the next 6 sts, DC in next 3 sts, HDC in next 20 sts, 2 SC in next st, 1 SC in last sts. Sl st to 1st st. Round 6: Ch 1, turn, (Looking at wrong side of work), Sl st in each st around (75 sts), turn. Round 7: Ch 1, turn, (Looking at wrong side of work), Sl st in each st around (83 sts), turn. Round 8: Ch 1, (Looking at right side of work) SC around, Sl st to beginning. Round 9: Ch 1, SC around, sl st to beginning. Fasten off. Rows 2-20: Ch 1, turn, SC in each st across. See video tutorial for sewing and visual instructions. Fold inward toward sole, sew along Row 1 of back of slipper making a tunnel. Stuff the tunnel with polyfil and sew open ends closed. Row 4: SC in 1st 10 sts, [DC2TOG, DC in next st] 4 times, DC2TOG, SC in last 10 sts, ch 1, turn. Row 5: SC in 1st 8 sts, [DC2TOG] 6 times, SC in last 9 sts. Ch 1, turn. Row 7: SC in first 4 sts, [DC2TOG] 4 times, SC in last 5 sts, ch 1, turn. Row 8: [DC2TOG] 3 times. DC in next st, [DC2TOG] 3 times. Ch 1, turn. Row 9: DC3TOG, DC in next, DC3TOG. Fasten off. This piece is worked separately and then sewn onto the slipper. Row 1: SC in 2nd ch from hook and across. Ch 1, turn. Row 9: DC3TOG, DC in next, DC3TOG. Fasten off with very long tail for sewing. Use Red Heart Yarn in Black for the eyes, use Variegated yarn for the circle under the horn. Fasten of with long tail for sewing. Fasten off with long tail. Sew to black portion of eye. SC around entire ear. Fasten off with long tail for sewing. Row 1: SC in 2nd ch from hook, HDC in next, DC in next, HDC in next, SC in last. With Variegated yarn and work in continuous rounds. Rnd 2-6: SC in each st around. Fasten off with long tail. Stuff it. Sew to slipper behind eyes/horn. Sew all pieces to slipper. Embellish by embroidering the mouth and nose. Add fringe to the piece behind the horn to make the mane. Sew everything closed after stuffing. Like these unicorn slippers?? Try the Tutti Frutti Crochet Slippers!! I created this Dynamic Window Granny Square design to add to our 365 Days of Granny Squares project. It uses variety of crochet stitches to create an interesting design! I hope you enjoy making your square! -Red Heart Super Saver Yarn in as many colors as you want. Beg. Cluster: Ch up 2, [Y/O, Insert Hook, Y/O, Pull through, Y/O Pull through 2 loops] 2 times. Y/O pull through all 3 loops on hook. 3DC Cluster: [Y/O, Insert Hook, Y/O, Pull through, Y/O Pull through 2 loops] 3 times. Y/O pull through all 4 loops on hook. Rnd 3: In any ch 2 sp: Ch up 4 (counts as TR), [DC, HDC, SC, HDC, DC, TR] in same sp, * [TR, ch 3, TR] in sc, [TR, DC, HDC, SC, HDC, DC, TR] in next ch sp, repeat from * around, sl st to ch up 4. Rnd 4: In any ch 3 corner sp: Ch up 4 (counts as TR), [TR, Ch 3, 2 TR] in same sp, * TR in next st, DC in next 2 sts, HDC in next st, SC in next st, HDC in next st, DC in next 2 sts, TR in next st, [2 TR, ch 3, 2 TR] in corner, repeat from * around, sl st to ch up 4. Rnd 5: In any corner: Ch 1, *[2SC, ch 2, 2 SC] in corner, BPSC in next 3 sts, BPHDC in next st, BPDC in next st, BPTR in next 3 sts, BPDC in next st, BPHDC in next st, BPSC in next 3 sts, repeat from * around, sl st to beg. sc. Rnd 6: In any corner: [Beg. Cluster, ch 2, cluster] in corner, * Ch 1, [sk 1 st, Cluster in next st] 8 times, ch 1, [cluster, ch 2, cluster] in corner. repeat from * around, sl st to beg. cluster. Fasten off. It’s my birthday! I created this Birthday Wish Granny Square to add to our 365 Days of Granny Squares project. It uses variety of crochet stitches to create an interesting design! I hope you enjoy making your square! –Red Heart Super Saver Yarn in as many colors as you want. Beg. Popcorn: Ch up 3, 4DC in same sp, remove hook, put hook in ch up 3, put loop back on hook, pull through and pull tight. Popcorn: 5DC in same sp, remove hook, put hook in 1st dc of grouping, put loop back on hook, pull through and pull tight. Picot: Ch 3, sl st in 3rd ch from hook. Picot made. Rnd 4: Repeat row 2, fasten off, weave in ends. Assembly: SC around cake (40 sts evenly) See video tutorial for specific stitches. Rnd 8: (See video tutorial to learn how to do this round) In top right st of the top layer of cake: Ch 1, sc in same st, Ch 4, sk 4 sts, sc in next st, Ch 4, sk 2 sts, sc in next st, ch 4, sk 3 sts, sc in next st, ch 4, sk 3 sts, sc in next st, [ch 4, sk 2 sts, sc in next st] 5 times, ch 4, sk 3 sts, sc in next st, ch 4, sk 2 sts, sc in next st, ch 4, sk last sts, sl st to 1st sc. Rnd 10: Sl st in ch 4 sp, Ch up 3 (counts as DC), 3 DC in same sp, *[4 DC, ch 2, 4 DC] in next sp, 4 DC in next 2 ch sps, repeat from * around. Sl st to beg. ch up 3. Sc in 1st st, *ch 3, sc in next st, repeat from * across. Fasten off, weave in ends. Fasten off, weave in ends. With Yellow, attach yarn to st, ch 3, sl st in next st, fasten off, weave in ends. I created this Hello, Sunshine Granny Square design to add to our 365 Days of Granny Squares project. It uses variety of crochet stitches to create an interesting design! I hope you enjoy making your square! Rnd 6: In any ch sp: Ch up 3 (counts as DC), [3DC, ch 2, 4 DC] in same sp, *4DC in next ch sp, [4DC, ch 2, 4 DC] in next ch sp, Repeat from * around, sl st to ch up 3. Rnd 7: In any st, Ch up 3, DC in each st around putting [3DC, ch 2, 3 DC] in corners, sl st to beg. ch up 3. Rnd 8: In corner: Ch up 3, *[sk 1st st, DC in next st, DC in sk’d st (X-Stitch Made)] 4 times, tack down petal putting X-Stitch through Picot, X-Stitch in the rest of the stitches on the side until the corner. (there should be 9 X-Stitches) on the side. In corners put: 2 DC, Long DC in Picot of petal, tacking it down, 2 more DC in same corner ch sp, repeat from * around. Ending with 2 DC, Long DC in Picot of petal, 1 more DC in same corner, sl st to ch up 3. Fasten off.